Restaurant wait staff and hosts and hostesses ensure dining customers have a satisfying experience. Waiters and waitresses, also called servers, take orders and serve food and beverages to customers in dining establishments. Restaurant hosts and hostesses greet customers and manage reservations and waiting lists. Servers may meet with supervisors to learn details about the menu and discuss food safety concerns. When serving alcohol, servers check customers’ identification to verify their age. In casual-dining restaurants, fast, efficient, courteous service is the priority, while in fine-dining establishments, servers and host staff emphasize personal, attentive treatment at a more leisurely pace. Some servers work in places other than restaurants. They may deliver meals to hotel or hospital rooms or even bring orders to customers in parked cars. Wait staff and hosts and hostesses are on their feet most of the time, and may carry heavy trays and hot plates. Even during fast-paced times, they must ensure that customers receive prompt service. Part-time work is very common, often with morning or evening shifts, including weekends and holidays. Some establishments are only open seasonally. 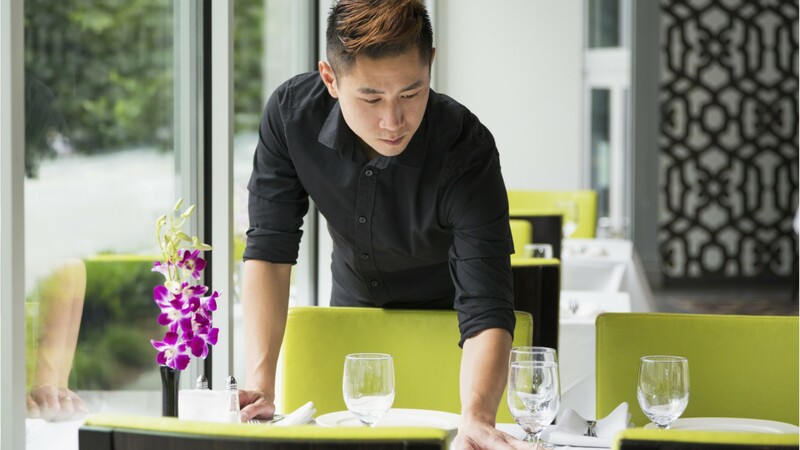 In some restaurants, host staff are required to wear formal attire, and wait staff wear uniforms. Wait staff typically learn through on-the-job training with experienced servers, and in most cases, there are no specific education or experience requirements. Some states require safety training for staff who handle food. See more details at O*NET OnLine about food servers, nonrestaurant. Food Servers, Nonrestaurant by U.S. Department of Labor, Employment and Training Administration is licensed under a Creative Commons Attribution 4.0 International License.